Projects Abroad has a Conservation Project in the Amazon Rainforest in Peru on a reserve called Taricaya. This project focuses on the animals of the forest and the environment. Recently, while monitoring the third group of spider monkeys that the team had released into the wild, they witnessed the group of spider monkeys they released 18 months ago interact with the newcomers. This group of spider monkeys was not only intact, but they also had a new member. 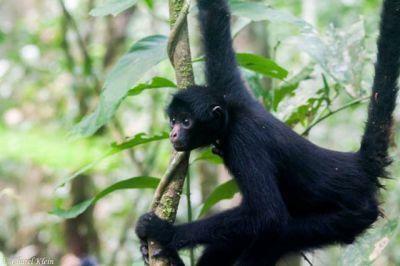 This was the first ever recorded wild birth of a black spider monkey that have been released and rehabilitated. This discovery means that the work done at Taricaya, from nurturing abandoned babies, reintegrating them to a pre-release enclosure and introducing them to a group before release, has proved to be the right formula.